The Air Wings w/ Uppers do a tremendous job of deflecting engine heat and away from rider and co-riders in hot weather. They also do a great job of deflecting cold air away in cooler weather. Our Air Wings w/ Uppers work well with HondaLine and most other windshields. The Air Wings also eliminate the buffeting on your helmet. 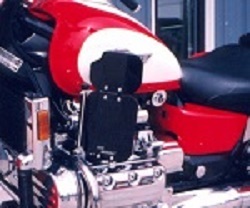 The Air Wings w/ Uppers are easily installed using the same bolts that hold the top of the engine guard to the frame. Hardware is available in black powder coat or chrome plated. These are also available in scratch resistant with color of dark tint, light tint, and clear. Please click here if you would like these.